Author Ed Moore interviewed Atlus Japan's Eiji Ishida and Kazuma Kaneko about the Shin Megami Tensei series of games (also known as MegaTen) for his article in Issue 279 of The Escapist. What follows is the full transcript of that interview. Stylized character design is one of MegaTen's strengths; the use of line, color, and shading is absolutely iconic and very striking. How do you research and design a demon's appearance and imagery and collaborate with other developers to bring the demons to life? Kazuma Kaneko: Thank you very much for your compliment. When I design demons, I start by researching their profiles in legends and folklores. Gods and demons that appear in myths greatly reflect the environment, culture and customs of the area they originate from. For example, both Zeus from Greek mythology and Thor from Norse mythology are thunder gods, but their attire and equipment are quite different. I get all that information in my head first, then give the demons new form, sometimes in accordance with their traditional image, and in other times giving them a modern interpretation. Once that's done, the only thing left is for me to draw them in a pose that fits their character. Whenever I fuse or recruit a new demon, I always check out its profile to learn about its background. I sense that you have a strong respect for mythology, folklore, and philosophy. Why do these elements interest you, and what experiences in your past inspired you to incorporate them into MegaTen? Kaneko: "What's at the end of the universe? Is there an end?" I think most people have asked this sort of question at some point in their life. Personally, I just love thinking about things like that. Even though humans are part of the universe, nobody knows why the universe exists, or how humans came into being. A philosophical approach is the only way we can reach some kind of conclusion. That's exactly what myths are-philosophical explanations of the universe and man-and why I love myths so much. The demons in the Megaten series all appear with these questions. It's not wrong to put everything into simple "good" and "evil", like in other games, but what's right and wrong can be completely different, depending on your position and perspective; it's very ambiguous. So I say, why not let each player tackle that question of what's right and wrong? 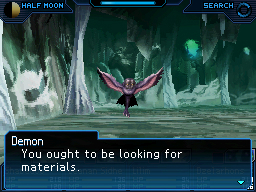 MegaTen games feature very creative settings for role-playing games. Instead of castles, elves, or other western fantasy tropes, they feature sci-fi/cyberpunk elements and fascinating alternate dimensions and realities. What inspires you to conceptualize these imaginative places? Kaneko: Because MegaTen is all about the ordinary lives becoming inconceivably unordinary, it has to be connected to modern society somehow. To accomplish that, we often adapt concepts theorized in cutting-edge science into the game. At the same time, though, a huge number of gods and demons from all over the world appear in MegaTen. They too have a close relationship with our lives, but it's more from a folkloric standpoint-you might consider that to be the analog approach, as opposed to the digital approach of science. We lay the foundation of the games by tying science and folklore-two seemingly incompatible approaches-together with philosophy. That's what makes the Megaten settings unique. There are so many things I draw inspiration from that I can't touch on all of them, but here's one example. In Japan, there is a Buddhist sutra called Hannya Shingyo. It's a philosophical teaching of how a person should live, containing the phrase "Shiki-soku ze-kuu, kuu-soku ze-shiki." Literally translated, it says that things with shape actually have no shape, and it's the things with no shape that have shape. It can be interpreted in a variety of ways, but the basic idea is that the world is in constant motion and everything is transient, so anything in this world can be seen differently, depending to one's personal perspective. I think about this and the quantum mechanics concept of Schroedinger's Cat as pretty similar ... That's kind of how I usually come up with ideas. Do you have a favorite demon or a race of deities from a certain mythology? If so, why? Kaneko: People ask me this question a lot, but having drawn many gods and demons, every myth is so fascinating and every demon is so dear to me that I just can't pick one demon as my favorite ... I'm sorry. For the myths, though, I like the Old Testament of the Bible. Many myths in the world share traits like the triad of deities, duality such as good and evil, the creation of the world, and the flood. But because the Old Testament is the most simple, it gives me the idea that it might actually be the root of all the myths. Why has MegaTen endured as a franchise over the past 20 years, and why has it become more popular in the West recently? Do you think it's because of the demonic themes and mature subject matter?